Many things can motivate us to join a community, but one thing keeps us committed to stay: Relationships. Whether it’s strong ties between fellow Club members, between a staff member and a parent or between a volunteer and a student, these relational bonds fuel the daily work of Boys & Girls Clubs of Metro Richmond. Relationships brought Caprichia Moses and her family into the Boys & Girls Clubs fold. Several years ago, she formed a friendship with Jade Tabb, who was working at a YMCA in Richmond. Caprichia’s sons, Kevin and Caleb, loved spending time with Jade, and Jade eventually let the family know that she was moving on to a new role at the Northside Club with Boys & Girls Clubs of Metro Richmond. The Moses family followed Jade to the Northside Club, and the boys immediately loved being at the Club and creating new relationships there. Caprichia, a busy single mom who worked in state and local government, was thankful for the ways that her sons, aged 6 and 8 at the time, connected with the Club staff and the numerous opportunities there. “I was eager for them to get engaged and create positive relationships,” she says. After the boys’ first day at Club, they came home talking eagerly about all of the friends they’d made and all of the activities they’d joined. Kevin, the eldest, was a sports fanatic. He loved having friends to play with who were his own age and skill level. And Caleb, who was just coming out of kindergarten, loved the feeling of empowerment he received from the staff and their guidance with his homework every day. Caprichia with her sons, Kevin and Caleb. She was especially grateful for the positive influence of the male staff members on her sons, noting how the male staff intentionally built relationships with Kevin and Caleb. “I was excited to see the level of involvement that the male staff had in my sons’ lives, taking their time to invest in them,” she says. The boys, for their part, were thrilled to be Club members. “Over the weekend, they’d say, ‘Why can’t we go to Club on Saturday?’” she laughs, recalling their enthusiasm. 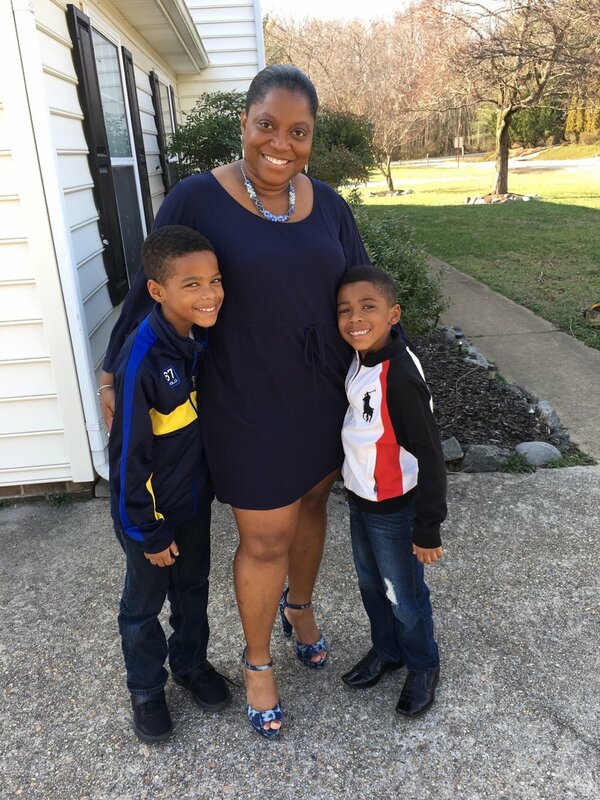 Now, Caprichia and her sons are even more closely connected with the Club, as Caprichia recently joined the staff herself, taking on the role of workforce development coordinator for Boys & Girls Clubs of Metro Richmond. Caprichia began working as a donor relations manager in September 2017, and then in December, she accepted the position of workforce development coordinator, drawing on her strong background in youth development and career enhancement. Caprichia participating in the Build Up School of Construction program with DPR Construction. With almost 20 years of experience in youth talent, training and career development, Caprichia has worked in various levels of the Virginia state and Richmond local governments. She worked for the city of Richmond for several years and then was recruited to work in the administration of Governor Mark Warner. Soon after laying the groundwork for the unfolding of the Workforce Investment Act — a federally funded program that aimed to increase the employment, retention and earnings of participants and develop their occupational skills in the commonwealth of Virginia — Caprichia accepted a position to complete the same tasks for the local workforce investment area under the administration of former Virginia governor, then Richmond mayor, L. Douglas Wilder. Under her leadership in youth and workforce development fields, Caprichia created the Mayor’s Youth Academy, a comprehensive youth development and workforce-readiness initiative that is still in effect today. With her familiarity with workforce development from the grassroots to the governmental level, Caprichia eagerly brought her skills and expertise to benefit the young people in metro Richmond’s Clubs. These days, Caprichia stays busy as she builds Ready2Win, the workforce development program for Boys & Girls Clubs of Metro Richmond. This spring, the program had a pre-pilot phase, inviting teens to apply and participate, and on June 25, the pilot officially launched. Ready2Win aims to help students get ready for the real world, whether it’s pursuing higher education, post-secondary training, the workforce or the military. Caprichia says that the program aims to channel the passions that Club members already have into opportunities to succeed after graduation. “We want to open up their worlds and let them explore far beyond what has traditionally been available to them,” she says. Students representing all of the Clubs in metro Richmond applied to participate in the Ready2Win pilot, and 23 students, aged 14 to 16, have since joined the program. The program has featured workshops covering such broad topics as personal and social responsibility, innovation and integrity, with the topic of inclusion up next on the docket. Hands-on experiences reinforce these skills, such as a day playing laser tag, to build leadership and teamwork; a day in an “escape room” to reinforce problem-solving skills; and a culturally reflective walk on the Richmond Slave Trail, promoting social awareness and pride in oneself. Students in Ready2Win also volunteer their time in community service efforts, serving local veterans, children with terminal illnesses and people who are facing homelessness. The program also gives students modest stipends, as if they were receiving a paycheck, and teaches them how to save and budget, thanks to a curriculum provided by Wells Fargo. Club members learn what it means to earn their own money and how to manage it well. Caprichia is committed to making Ready2Win an elite ambassadorship program, creating a community of students who are seen as the “cream of the crop” in metro Richmond. She wants to build a cohort of young people who are highly sought after by colleges, employers and other entities throughout the area, whether for internships, full-time employment, motivational presentations or other career and educational opportunities. In the fall, Caprichia expects to open up the program to Club members of all ages, not just teens. Ready2Win is just one of the ways that Boys & Girls Clubs of Metro Richmond is expanding its programs to ensure that all young people in Richmond are ready for whatever life brings their way. A young man who was a Club member recently graduated from high school. Caprichia got to watch him as he prepared to walk across the stage at graduation. He’d long dreamed of starting a career in nursing, but amid a number of financial difficulties and barriers, that dream seemed like it would be deferred. But thanks to the support from his Club director, his mentor and his Ready2Win family, this promising young man will be entering a nursing program in the fall. Setting students on a path of success motivates Caprichia in her daily work. She acknowledges that progress can sometimes seem slow and steady, but that’s how long-lasting change is created. Caprichia with students from the Ready2Win program. With the success of the Create New Statistics campaign and with plans to build a Teen Center under way, she is excited about the opportunities the new center will offer metro Richmond’s young people and the ways that the space will build on the success of Ready2Win and other pertinent programs designed for Club members. “I will do all I can to get them ready, but they will have to decide to become Ready2Win,” she adds, noting the values that form the name of the program, which aims to develop metro Richmond teens who are Ready for success, Enthusiastic about their future, Ambitious and affirmed, Determined to succeed, Yielding to the development process, Willing to go beyond the status quo, Intentional about achieving their goals, and Neighborly and productive citizens. Learn more about how your support can benefit programs like Ready2Win.